To say the very least, it has been a most fascinating week. It is not over yet and there are a wide array of events taking place in the Kingman area today ranging from a bluegrass festival at Stetson Winery and Chillin’ on Beale to the monthly open house for the Route 66 Association of Kingman (tonight, 6:00, Ramada Kingman)and a nifty fifties car show. Still, no matter how much fun is had today, I am rather confident that nothing will top last evenings adventure. It started off simply enough, photograph the reception for the 2nd annual National Route 66 Motor Tour at the Powerhouse Visitor Center in Kingman. Then I received a text message from Tudor Melville, an acquaintance from Phoenix who is also the owner of Suntech Circuits Incorporated as well as a new Tesla. He was in town for the festivities. 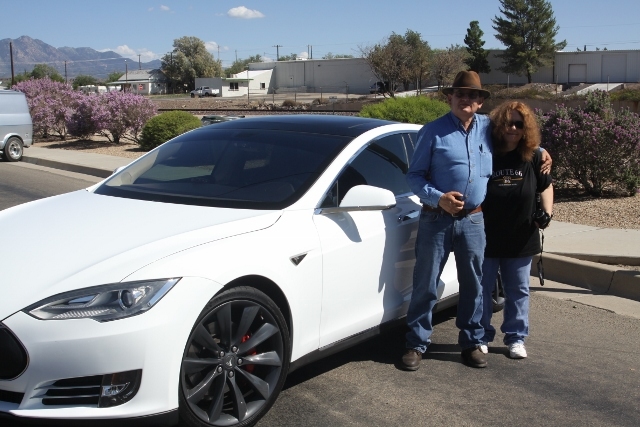 Tudor had introduced my dearest friend and I to the futuristic wonders of Tesla last year in Kingman during the Route 66 International Festival and the opening of the Route 66 Electric Vehicle Museum. This time he was driving a bright red model purchased in December that had recently been upgraded with the Autopilot download. I lean heavily toward living in a world where the simplicity of the Model A Ford represents the zenith of automotive engineering. Still, technological gadgetry really intrigues me and Tesla has this in spades. In fact it pushes the envelop for making gadgetry practical to such a degree that in comparison every new car in showrooms across America appear as outdated as a Model T.
I will post a video later today about our drive last evening. There is the very real possibility that I was the first person in history to cruise Route 66 in a fully automated automobile, as in “look ma no hands on the wheel”, self braking, lane changing, speed setting automated car. It was both disconcerting and fascinating. Likewise with whisper silent acceleration that literally pins you to the plush seat. A topic of discussion aside from the wonders of the future today was a rally under development by Open Road Productions. As envisioned, the rally from Chicago to the 90th anniversary Route 66 celebration at the original western terminus of that highway in the renovated theater district of downtown Los Angeles next fall would be a literal parade of automotive history. Tesla owner participation would really round out that parade through the heartland quite nicely. 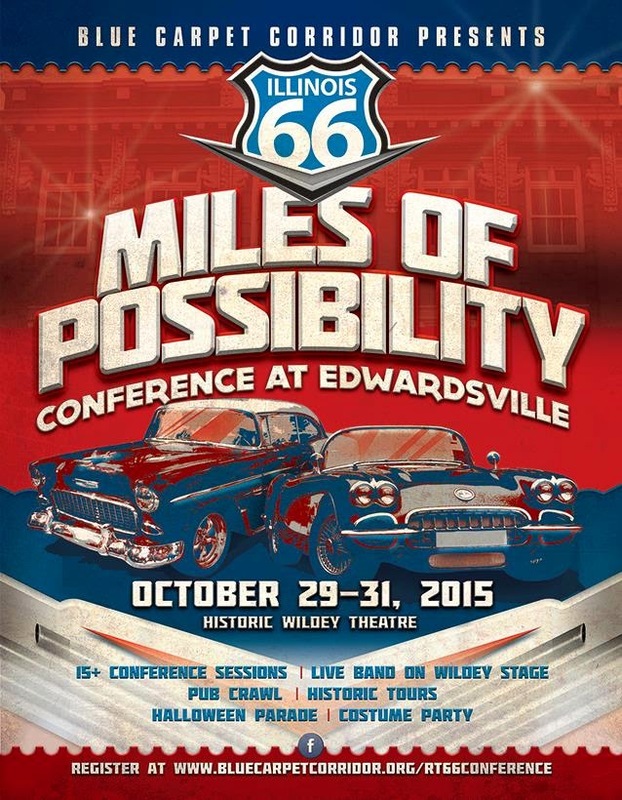 In addition to making a presentation on how to utilize the Route 66 renaissance as a catalyst for community development at the Miles of Possibilities Conference in Edwardsville, Illinois the last weekend of this month, I will be sharing a display booth with Rick Thomas of Open Road Productions in the exhibition hall at the historic Wildey Theater. We should be able to provide more detail about the rally at that time. I should also note that books will be available as well as a wide array of informational brochures from the Kingman area. Of course I will also make myself available to answer questions and to assist with Route 66 travel planning. Most of this past week was consumed with projects to be resolved before we head out on our road trip or related to exciting developments in 2016. Next week looks to be more of the same. Assistance was provided for development of a brochure developed by Ramada Kingman to promote the areas 160 Miles of Smiles marketing campaign (I will have these available in Edwardsville as well) and there was a radio interview on a Lake Havasu City station as well as a meeting with city officials to lay the foundation for a series of programs to revitalize the Route 66 corridor in conjunction with the Celebrate 90 initiative. I also worked with David Keppel in an effort to move the self publishing endeavor forward, and continued with contract negotiations for a new Route 66 book. Now, it is time for some much needed rest and relaxation, a deep breath, and time spent with friend before charging headlong into next week, which promises to be even more hectic than this past one.